Just book your ride through our website, we guarantee the price! 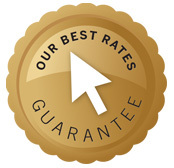 Our Best Rates Guarantee assures you receive the best rates when you book a ride directly us. If you find a lower publicly rate anywhere else, we will match that rate. No matter where your destination is, if you have found a better rate through another booking channel, submit a claim and, within 24 hours, our support team will determine eligibility and contact you.